I ran track (that sounds very American, doesn’t it?) at school. I had a best of 2.13 over 800m. I was distinctly average. I never came close to winning anything. I recall 800m races being uncompromisingly hard. I continued my mediocrity at university, memorably running the 1500m in 4.29 at a BUSA indoors championship while representing the University of Central Lancashire. After going out the previous evening, I arrived at the venue and was quickly horrified to realise the 1500m heats were scheduled first on track. I finished last but one, trailing in the wake of guys running close to four minutes who presumably went to bed sober and before 2am. Our team captain played Eye of the Tiger before the race; thereafter, all I remember was the sound of my spiked feet hopelessly slapping wood. And that was that, apart from a one-off 3000m track race in Peterborough some seven years ago. I remember the time – 9.56. Of course I can remember; runners don’t forget such things. 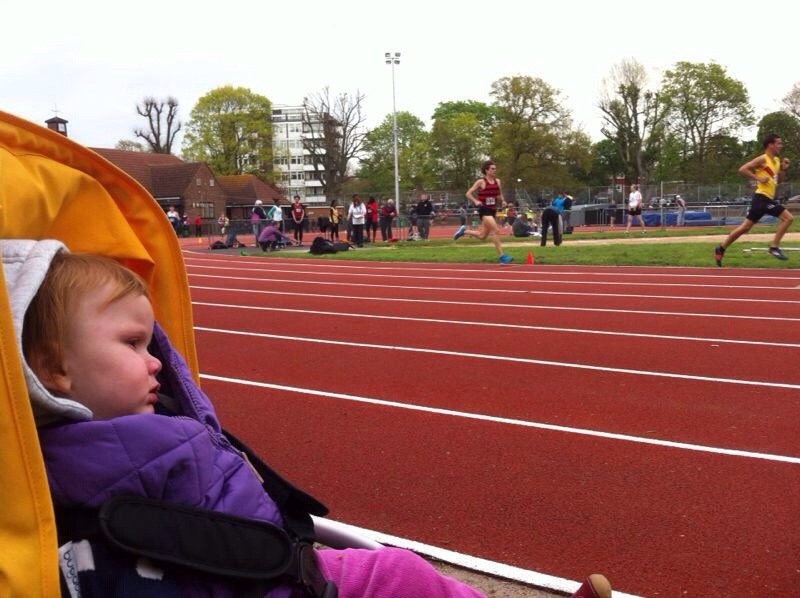 Today’s affair at the Herne Hill Harriers’ open meeting was delayed by 15 minutes as we waited for the end of the 100m races. There were 17 of them. Seventeen. Who wanted to run 30 times further? Eleven people. There was a handful of home athletes, pairs from Hercules Wimbledon and Clapham Chasers, and a sole representative from Kent AC. There was also a keen-looking lad on the line, perhaps 13 or 14 years old. If he’s beating you, I mentally told myself, you drop out. I am fifth, then fourth after 200m. I move into third, then second, with first – the taller of the Hercules duo – running further away with every stride. He has gone. The race is surreal. I lose second place to the other Hercules man. The effort hurts, but am I suffering? Not really. I’m just struggling to go any faster. Running a five-mile threshold around Dulwich Park two days earlier was harder than this. I persevered. Suddenly there was a lap to go. The bell was ringing. Perseverance wasn’t enough to claw back second. I stopped the clock at 9.40. ‘You didn’t look like you were running very fast,’ a friend remarked after. clearly the presence and support of ‘Little A’ powered you to your ‘kid beating’ victory! She was massively unimpressed by my efforts!